Once again we have some exciting new feature releases and enhancements to share with you all. Ready to take a look? When it comes to creating the perfect document bundle, we've got you covered. We provide you with everything you need to get the job done. Need to merge or split documents? Re-order or delete individual pages? Even rotate or simply deskew scanned documents? It's all possible using Bundledocs latest range of manipulation tools. There is no need to purchase additional software. There is no additional costs involved. We offer everything as standard - whether it's powerful document collation tools, secure sharing, OCR, document manipulation, redaction, annotation (and much more!) - Bundledocs does everything you need. And did we mention, it's incredible simple and easy to use? In last month's Feature Release post, we announced the introduction of our latest range of annotation features - which now include the ability to redact, add comments (public or private), highlights, labels, and pin-point links. We were delighted to hear so many of you are finding them helpful already! Add Multiple Links At Once: Now you can use our 'find all' feature when adding document reference link annotations. This will allow you to add links to any/all instances of a term with a single click! Add Some Colour: You can even change the background colour for your document reference links - or even choose transparent if you would like no specific colour to appear. If you have not yet discovered our latest range of annotation features, then login to Bundledocs today and try them out for yourself. As many of you know by now, within Bundledocs you can securely send bundles to anyone using our 'Forward Bundle to Third Party' feature. This is a really quick and convenient way to send bundles - particularly if they are too large to send via email. This month, our team have added an enhancement to our secure send feature. What is this you ask? Our latest feature release allows you add an expiry date to any bundle sent from Bundledocs. Not only that, but you can set a max download limit too. Remain in control of your bundle at all times. Check it out for yourself here. Over the years, Bundledocs have partnered with the world's leading case and document management systems - including iManage, NetDocuments, Tikit TFB Partner for Windows, Worldox, Actionstep, Dropbox, OneDrive - to help make your life easier. As a cloud first solution, all our cloud-based integrations are readily available from the uploads area in Bundledocs. There is no need to install anything, just click and go. Then for any of our clients that use systems such as iManage, P4W, Timeslice Lawman or any of our on-premise partners - we've got you covered too. As all our integration connectors come completely free of charge. If you want to access the latest version of our integration, all you have to do is get in touch. Need a quick run-through of any of our new feature releases? Contact our dedicated support team today. It's completely free so there's no reason not to! At Bundledocs we are committed to ensuring we offer the most comprehensive bundling solution on the market today. We know that busy legal professionals do not have the time to allocate to long training sessions or read through copious amounts of training materials. That's where Bundledocs comes in. Working in the legal world for over 14 years, we know that is it imperative that our solution is simple and intuitive to use but also powerful to ensure that every bundle produced is prepared precisely, is of high quality and can be provided to the court in good time. When it comes to producing your bundle, we know that depending on the type of bundle you are producing you may have different requirements. From working with our clients we became aware that some of you would like the option to apply your own font/styles to your bundle. You asked. We listened. We are delighted to announce the introduction of our new Fonts & Styles feature. Our latest release allows you to specify the look of your index pages, sections and page numbering used in your completed bundle. Want to learn more? We will be highlighting our latest release over the next few days so make sure to follow us on Twitter, Facebook and LinkedIn to keep up to date with the latest. Can't wait until then? Our updated manuals are live and are free to download now. Can I add a date field into my Bundledocs Index? 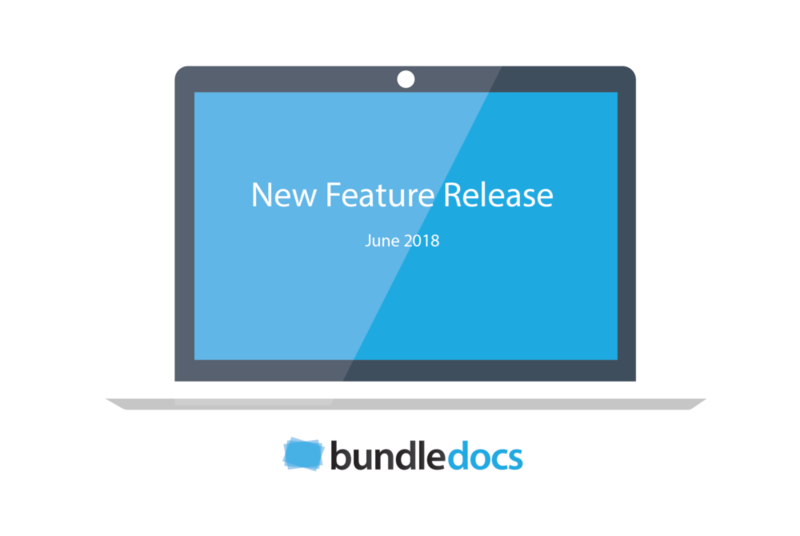 If you missed our new feature announcement yesterday, Bundledocs latest product release enables you to effortlessly include document dates within your completed index. Step One: Create your bundle. Step Two: Within your 'Edit Case' options, choose to 'Show Document Date on Screen'. Step Three: Need to edit your document date? No problem. This can be done easily by simply double clicking on any document date. Step Four: To include document dates within your completed bundle, select the 'Show Document Date in Index' when generating. Step Five: That's it. Simply download your complete bundle to complete. Find out more about our new dates feature now. Download your Free copy of our manual today and find out everything there is to know about Bundledocs.